In 1886 the first of the Grant Brothers arrived in the Boxelder Park area and took out homestead claims. In 1890 my great grandfather came to work with his brother and took out his own homestead claim. 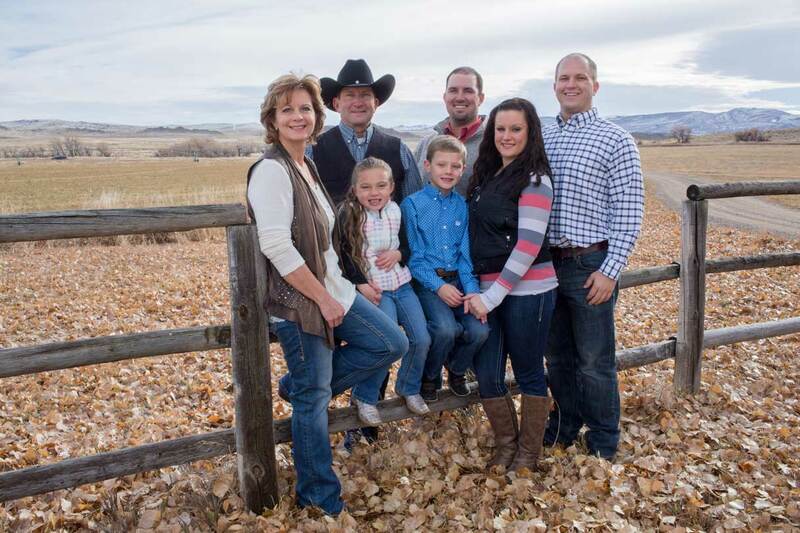 Throughout the next several years they each continued to buy land to expand their ranching operations. In 1916 my great grandfather purchased the ranch that we operate today. Our family has lived and worked on this land now for five generations. We run 350 cows and 200 yearlings on our ranch. We grow all of our hay and harvest it for the animals winter feed. When my great-great grandfather first homesteaded here over 100 years ago, everyone burned wood and or coal if it was available for heat and kerosene lanterns for light. Electricity changed everything and made the modern world. In the 21st century, everything will change again. In this part of the country, the wind blows most of the time. Keep in mind that Wyoming is one of the windiest states in the union. In the winter, the wind robs heat from our cattle, chills and even freezes new born calves to death.The wind can blow hard enough that we lose a lot of the hay that we feed the cattle. This causing us to have to over feed to insure that the cattle get enough feed each day to meet their daily requirements. Flat out, the wind costs us money. In 2007, we started hearing about plans to develop wind energy here in Wyoming. In March of 2008, the neighboring landowner and I decided to see if we had the quality of wind for the development of a wind project. We leased an anemometer for a year to gain valuable information that was needed for wind development. Before we had even collected a years’ worth of data the wind developing companies started knocking on our doors. When we first started talking to utility-scale wind developers, the area landowners who agreed to wind development concluded that Wasatch Wind was the most viable company in the bunch. Over the next several months we worked on developing a contract that everybody could live with and agree to. In September 2009 we entered into a contract with Wasatch Wind to develop the Pioneer Wind Project. What this contract meant is that the wind is finally going to pay me back for what it has robbed from us for so many years. We quickly learned we needed to understand power purchase agreements, site development, wind research, potential impacts on wildlife and the environment. We had to get smart and learn everything we could as we considered what it would take to build one of the first private wind farms in the state of Wyoming. Here's what you need to know about Wyoming, it is an export state - we export coal, gas, beef, soybeans, oats - and even our children. Our children have to leave our state because we don't have enough jobs to keep them here at home. Farms and ranches operate with such tight margins it is extremely difficult to provide financially for more than a couple of families. Exporting power generated by the Pioneer Wind Project will provide sustainable revenues that families here can count on for decades. Every dollar we get from a lease or rental agreement is a dollar we don’t have to pay in interest. The money stays in our pocket and goes back into the operation. This means we can continue working on our ranches and allows us the opportunity to bring our kids back home to become the next generation of ranchers. The main thing landowners need to realize is that the wind project will change your landscape. I'd much rather see our ranches and farms with wind turbines across the landscape than a housing subdivision. Personally, I like the look of the turbines. Beauty is in the eye of the beholder. However there are people that are never going to like the turbines or change of any kind for that matter. We started working directly with Christine Watson Mikell early on in the project and she was in charge of development. She was the one who made contact with landowners, environmental groups and public officials. She lined up operators, developers and contractors. "Christine is up front. She tells it like it is. If you ask a question and she doesn't know the answer, she'll find out and get back to you and tell you what you need to know." The Pioneer Wind Project has taken a lot longer than we ever imagined because of legal challenges. The landowners involved in the project, along with Christine and her team stuck in out and eventually the courts ruled in our favor. After clearing the many hurdles and delays since the signing of the contract in 2009, the Pioneer Wind Project broke ground in May of 2016 and is scheduled to be completed and commissioned to produce electricity by the end of October 2016.